So I'm a little behind with my Christmas Advent Calendar. 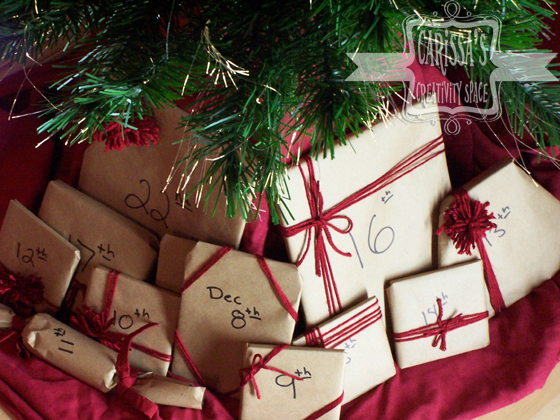 I'd had this idea (or something similar) a while ago but since it required purchasing 24 books (we only owned 1 Christmas book before starting) it took a little while to find an affordable way to do this. FINALLY this week Dollar Tree got Christmas books. And even better...some of them came in a two-pack! Woo hoo! Fifty cent books baby! *Ahem* Sorry. Let me stifle my inner book nerd and regain my composure. Anyway, Dollar Tree finally getting Christmas books was a huge relief since even the books at my local Goodwill were more than I wanted to pay. So what did I do with them? 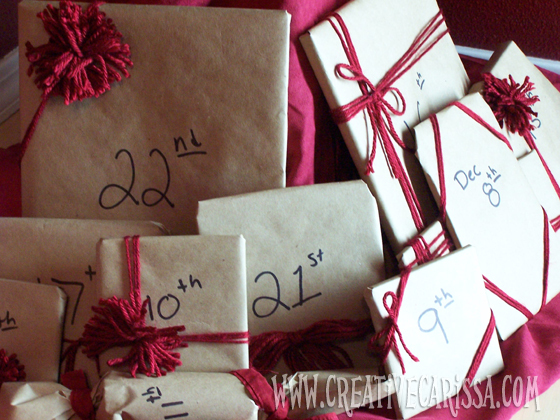 I have 24 different books or small presents wrapped and numbered under a small tree in the corner. I could not find 24 books I liked, so I do have some small presents like bubbles, coloring books and markers for 6 of the items. Next year I'm hoping to have all books (Christmas clearance shopping here I come!). So we get to open one present a day and after Christmas, we can pack them all books up to reuse next year. 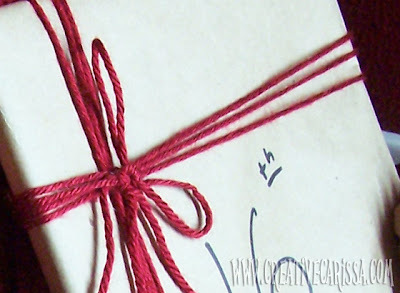 What about the gift wrap? 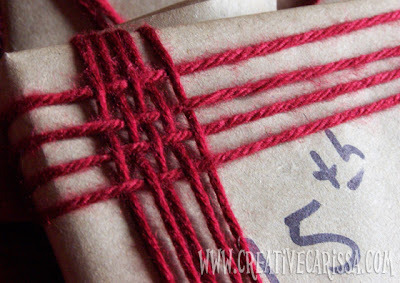 I adorned the humble packages with scarlet yarn. 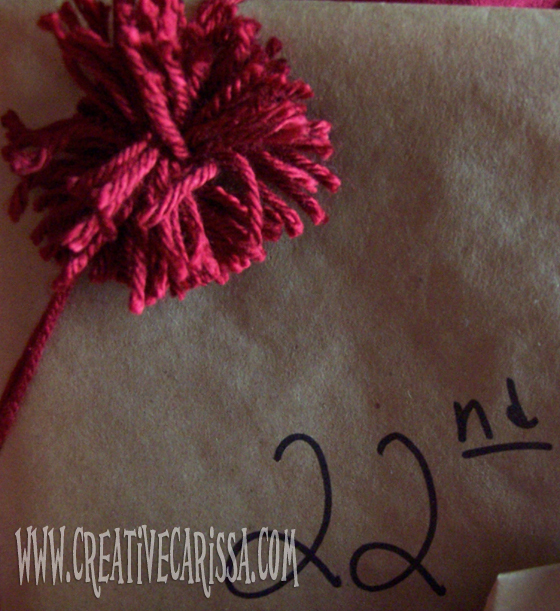 Scarlet yarn is talked about a lot in the Bible for the building of the tabernacle. When God gave instructions for how to build the Tabernacle, he had the artisans use scarlet and other colors typically reserved for royalty. So how fitting, then, to tie in the scarlet as we celebrate the time when God came to Earth to dwell (literally: "Tabernacle") amongst his people? I love giving shout outs to the people who inspired me even if my stuff ended up totally different from theirs. 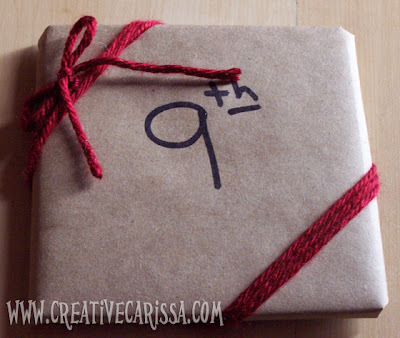 So...thanks to KatherineMaries.com for sharing the great idea to use books to countdown to advent and Jessica from Mad in Crafts who is also doing beautiful scarlet Christmas decorations, though from a different chunk of scripture. I'm sharing with these great parties. Come join the fun! Thanks so much for linking up! Love this idea!